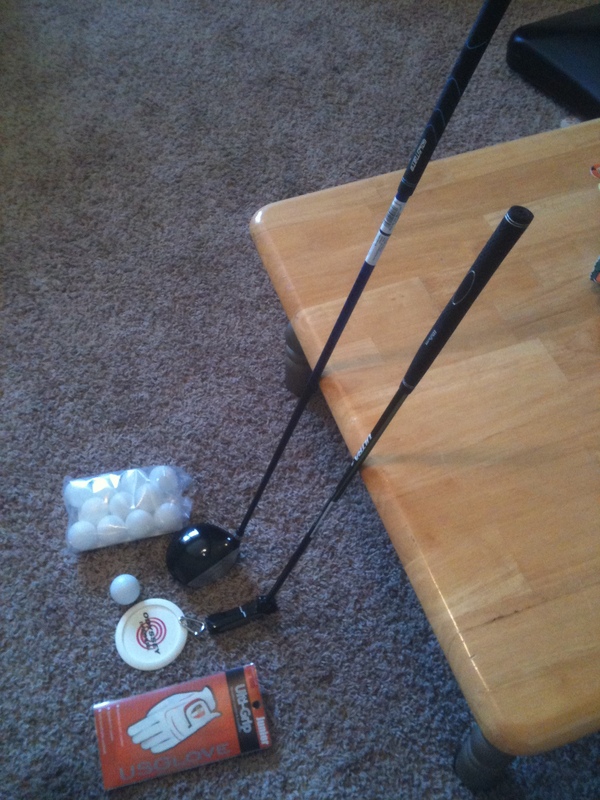 Jadon and I went and picked out his first real golf clubs and glove. 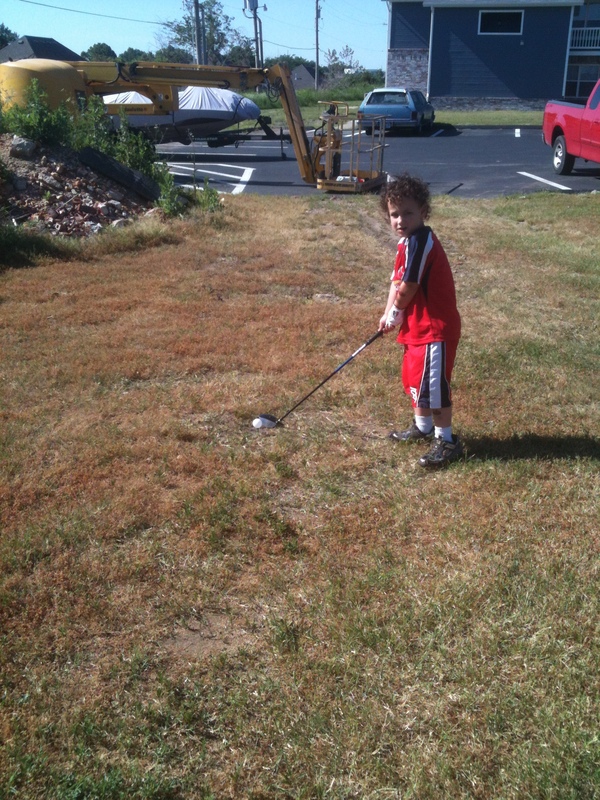 We also picked up some plastic golf balls and a fake hole for him to practice inside with. 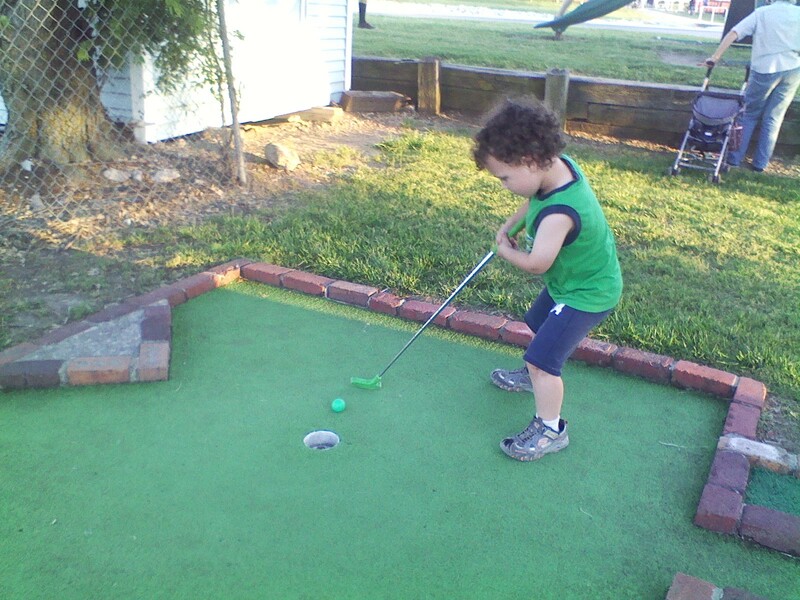 Jadon lining up his shot…maybe standing directly in front of a five year old with a golf club isn’t the wisest move. 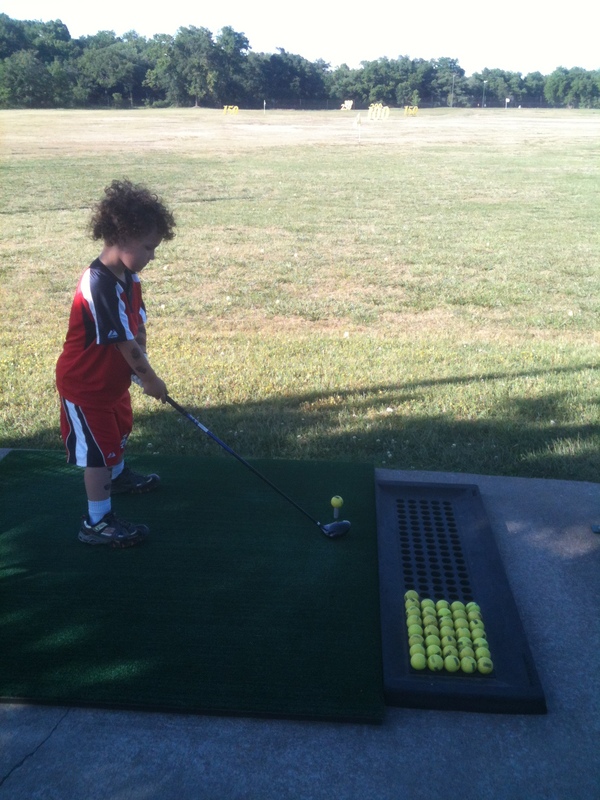 Jadon’s first time on the driving range…he had to make sure all the balls were lined up perfectly in the holes on the mat. Apparently he was so good that the president decided to fly over and check it out. 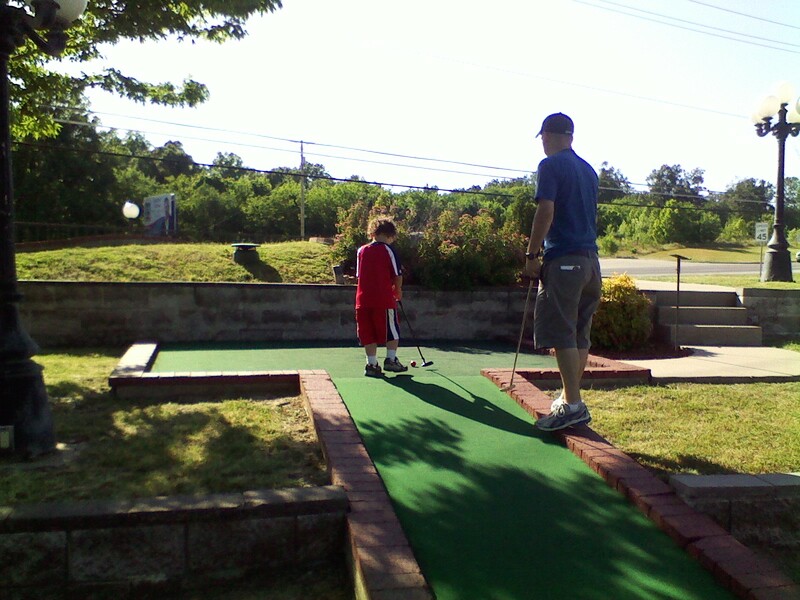 We went and played mini-golf as a family. Jadon came in second out of three people…I’ll let you guess who came in first and who came in third. Jadon helped me out by being the flag. Unfortunately, no flag could have helped me much on this hole. Not a bad first week as a golfer for Jadon – he beat one of his parents at mini-golf and had the president of the United States fly over to watch him on the driving range. If he keeps up the amount of practice he’s been putting in, he may beat me by the end of the summer. It’s been quite the exciting past few days for Jadon! 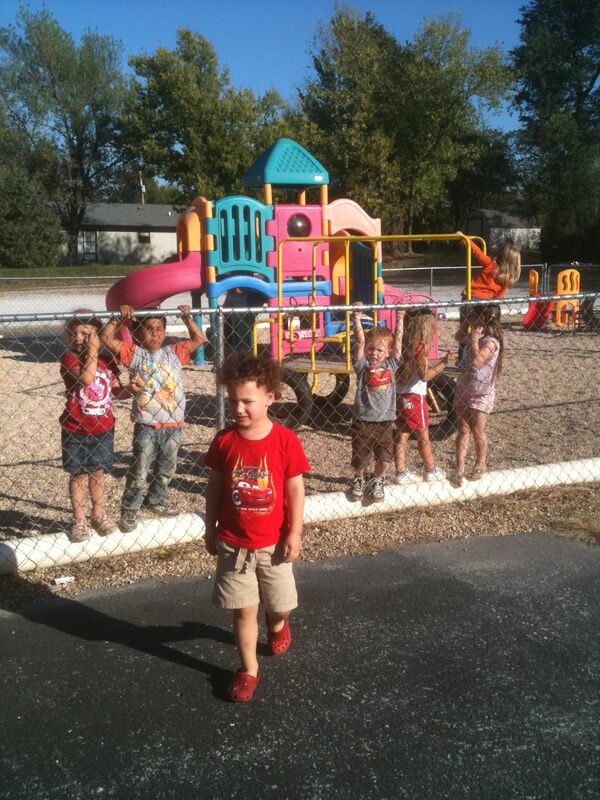 On Wednesday, he got to go to Carousel Park and have a blast with his friends from church. Carterville Christian Church rented the place out and had a great turnout – all for free to those who came! What a fantastic idea and a great time! 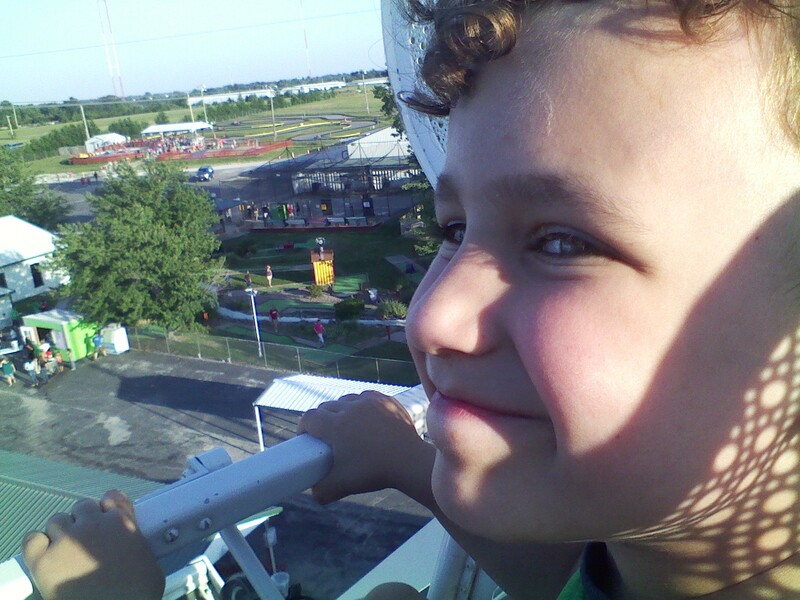 Jadon loved the Ferris Wheel – I think Daphne was more scared being stuck at the top than he was. 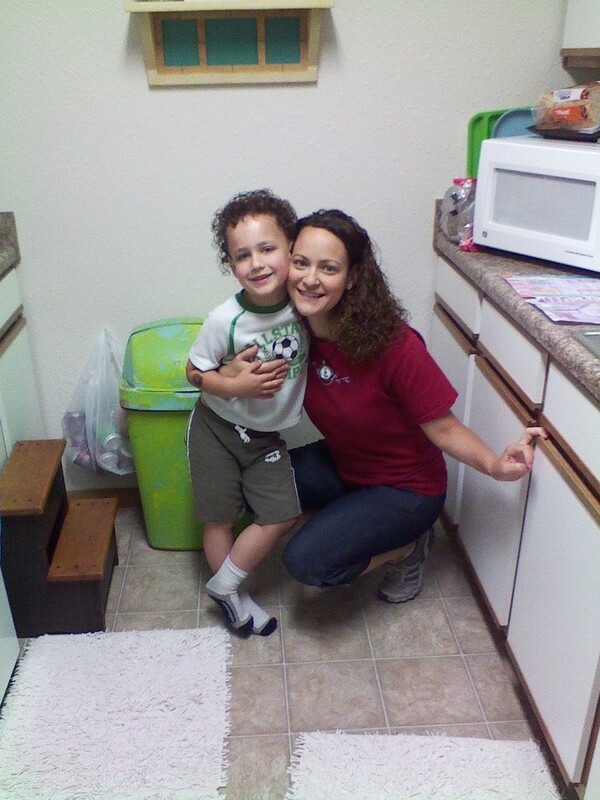 Love this picture – what a great job by Jadon’s mommy/personal photographer. 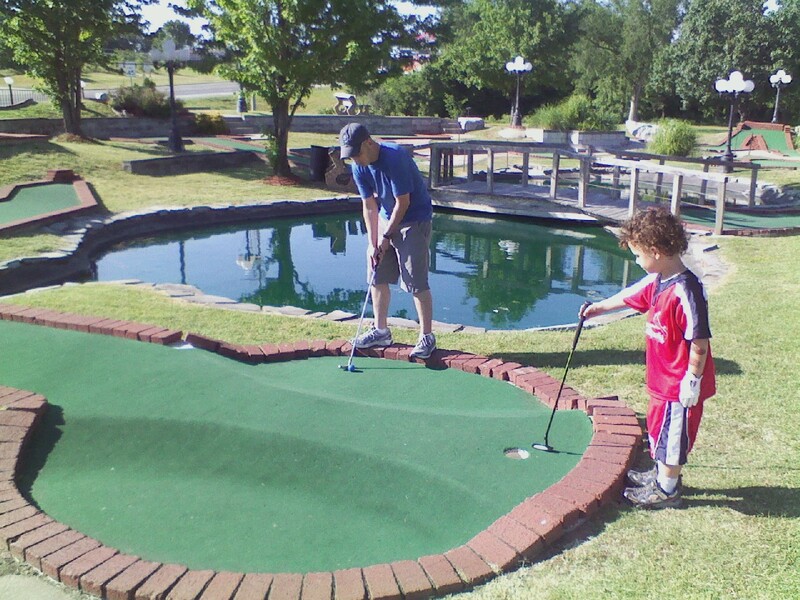 He also got to play some mini-golf. I may have to try out that grip sometime – maybe it can fix what’s wrong with my game. 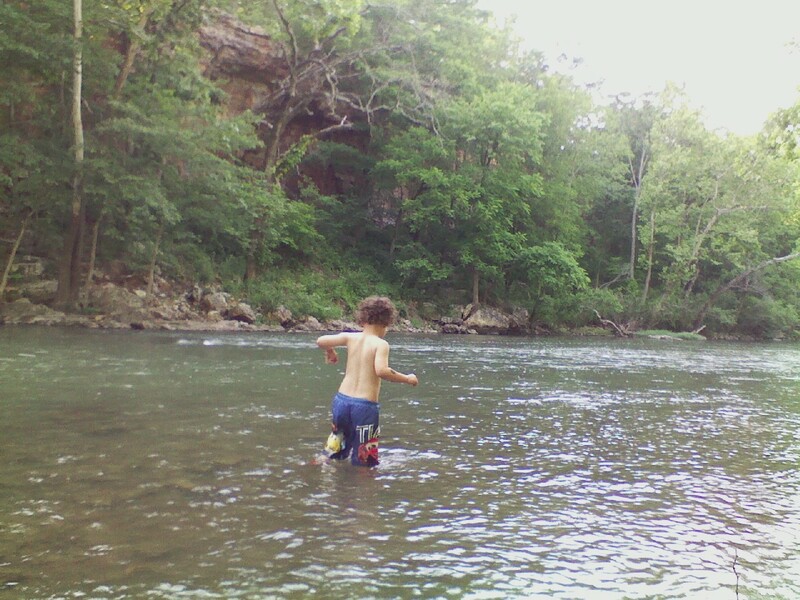 Jadon and Daphne also went to Wildcat Glades on Thursday and had a blast playing in the water. I think that boy must be half fish because he loves being in the water! Friday may be the most exciting day of the week for these two because it means…the last day of school! They are both pumped for summer and Jadon is already getting excited to start kindergarten next year. 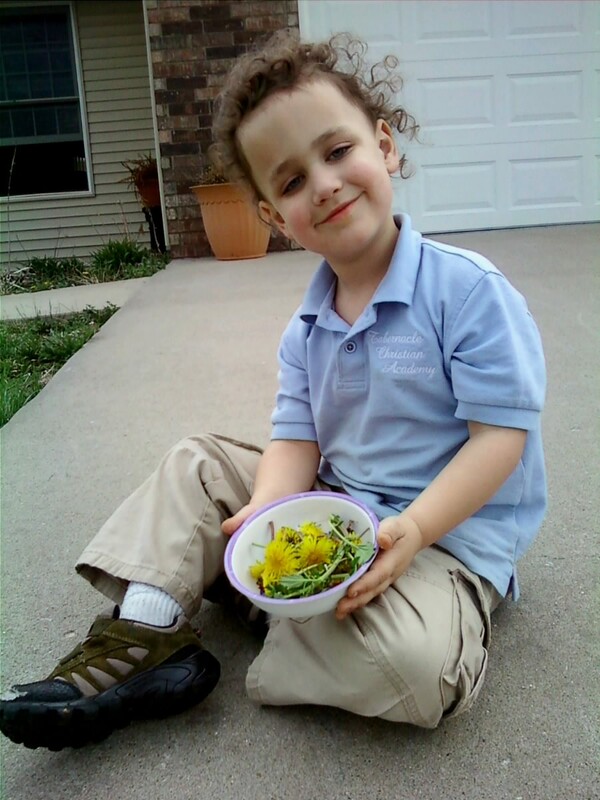 Hard to believe that this is his last day of preschool and that he’ll be starting “real” school in the fall. It’s been an exciting week and hopefully this summer will be more of the same! Depending on the song, it can be either a good thing or a terribly annoying thing when your 5 year old finds a song that he loves and wants to listen to over and over again. For your listening pleasure…here are two of Jadon’s favorite songs right now. These are the songs that he loves to listen (and sing along) to repeatedly when we are driving in the car. Every time we listen to one of these songs and it comes to an end, I hear “Again!” being hollered from the back seat. Luckily, Daphne and I both like these songs too, so they still have yet to turn into the kind of songs that make you want to rip your ears off the side of your head. Holy moley – can you believe it? Jadon Payne is 5 years old today! 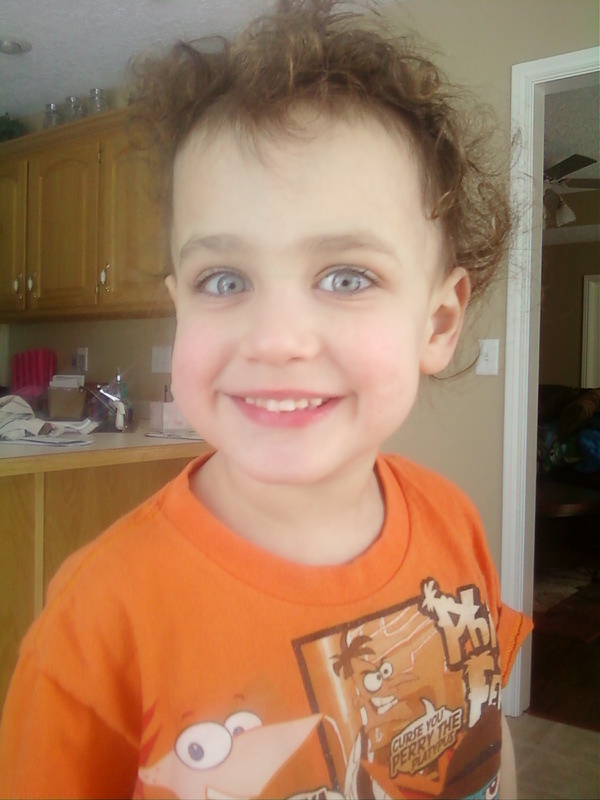 Happy birthday Jadon! I think someone must have increased the rate at which time passes because these last five years have flown by. Jadon has definitely changed our lives for the better and brought more laughter and entertainment than I ever could have imagined. We are so proud of that boy and can hardly wait to see what the next 5 years hold…and the next 5…and the next 5…and the next 5…and on and on.